“G8 Foreign Ministers confirmed their commitment to a just, lasting, and comprehensive peace in the Middle East. They agreed on the urgent need to make progress on the Middle East Peace Process towards this goal and underscored the need for a major international effort, involving all relevant parties, including the Quartet, to drive the peace process forward. “The Ministers welcomed President Obama’s visit to the region and his statement that peace between Israelis and Palestinians is necessary, just and possible. They urged both sides to show the bold political leadership needed to achieve peace, to take the necessary steps to build trust and to work towards the resumption of negotiations without preconditions. “The Ministers stressed that a long term solution to this conflict can be achieved only through direct negotiations [my emphasis], taking note of the 23 September 2011 statement of the Middle East Quartet. Ministers called on parties to refrain from unilateral actions and to create an atmosphere conducive to peace. They strongly reaffirmed that unilateral actions by either party cannot prejudge the outcome of negotiations. “Ministers expressed grave concerns about the poor state of the Palestinian economy, and the impact this has on Palestinian state-building efforts. Ministers affirmed their support for the Palestinian Authority and encouraged Arab countries, as well as emerging economies, to extend the fullest assistance possible to revitalising the Palestinian economy. What a driveling, sniveling way to mark 65 years since the massacre at the Palestinian village of Deir Yassin, near Jerusalem. The slaughter set a pattern for the reign of terror that was to engulf hundreds of other Palestinian towns and villages in the Jews’ bid to grab as much territory at gunpoint as they could. The village had signed a non-aggression pact, yet Jewish terror groups the Lehi and Irgun, the latter headed by Israeli prime minister-to-be Menachem Begin, exterminated over 100 men, women and children, who were either stood against walls and shot or shredded by hand-grenades thrown into their homes, which were then looted. The atrocity was committed weeks before the state of Israel was declared. Under the 1947 UN Partition plan Deir Yassin was to be part of the Jerusalem ‘corpus separatum’, not the future Jewish state. Indeed, the Palestinian Centre for Human Rights (PCHR) – www.pchrgaza.org – reports weekly the alarming details of Israel’s systematic attacks against Palestinian civilians and property in the occupied Palestinian territory in flagrant violation of international law and international humanitarian law. Last Christmas the Palestinian embassy in London said that if the UN Security Council didn’t act against Israeli settlements Palestine would “consider complaining to the International Criminal Court, an option made available by Palestine’s admission as a non-member state to the UN in November”. Since1967 the Security Council has taken no action whatever to stop Israel’s illegal settlement building. By action we mean, of course, deeds not empty words. We mean sanctions and the implementing of all those inconvenient UN resolutions ordering the Israelis back behind their pre-1967 lines. Why should there be any hesitation in taking Israel’s most heinous crimes to the International Criminal Court? The ICC has jurisdiction over genocide, crimes against humanity and war crimes committed by nationals of a State Party or on the territory of a State Party since 1 July 2002, the date the Rome Statute came into effect. Palestinians have potentially a huge backlog of business to put before the Court, although they may not be permitted to bring cases going all the way back to 2002. Well, it’s been taken care of, as from 29 November 2012. 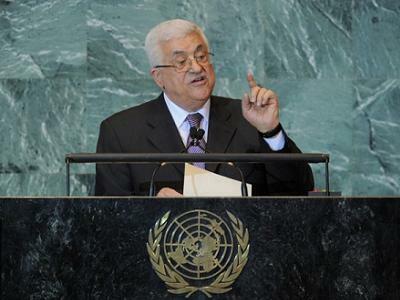 193 member states of the United Nations now recognize the State of Palestine. John V. Whitbeck, in an interesting article in the Palestine Chronicle, reports that Fatou Bensouda, the new Prosecutor of the International Criminal Court, said recently that since the UN General Assembly made its determination that Palestine is a state “the ball is now in the court of Palestine… Palestine has to come back”, and “we are waiting for them”. For the last five months why the blazes have President Mahmoud Abbas and his administration done nothing to bring matters forward while the Israelis continue to establish more ‘irreversible’ facts on the ground designed to make their occupation permanent? Why does he think all those other nations gave Palestine its new status? His foot-dragging is explained by a report in ReliefWeb.int a few days ago that Abbas will hold off from unilateral action against Israel to give the stalled US-brokered ‘peace talks’ a chance to resume. “Abbas and the Palestinian leadership have decided to give a sufficient chance for (US Secretary of State) Kerry’s efforts to succeed,” said an official. The Palestinians’ success in securing upgraded status at the UN late last year is said to have angered Israel and the United States. So for another two months the Palestinian leadership will refrain from taking Israel to the International Criminal Court while Kerry tries to re-start the bogus peace negotiations. Since this ploy is in no-one’s interest except Israel’s, the question is, why? Right now Abbas, the Palestinian Authority and the PLO should have their tails up and be setting the pace, setting the agenda. And it shouldn’t include being pushed into more talks that lead nowhere. Justice must be done here and Palestinians should not be bullied into pleading or bargaining with a brutal occupier for their freedom. This is the 21st century and political preachers and sermonizers in the West need to understand that the dishonest, arm-twisting, lopsided peace process is dead. What is needed is a no-nonsense TRUE JUSTICE process driven by the rule of international law. The facts ‘on the ground’ show peace is a “paper” policy. Nothing more. So someone will have to make a real plan. Is there anyone able and willing? I’m unsure. The disabled PA or all the Palestinians (most without a voice)? The rioting Egyptians? Not much chance there!, The Syrians? involved with their own country? Impossible, ditto the Lebanese, the Arab states, the rest of the world . . . There’s no one, it seems! It is an emergency, no doubt. What is worrying is the amount of “paper policy” in the past of the UK, USA, everyone it seems. So, new ways and new leadership are essential in forging change. The first issue is WHO? the second issue is, in peace or war? We should all use this first line. For horrendous crimes and imprisonments committed and ongoing against the Palestinian Peoples including the illegal occupation, continued population reduction by murder and massacre, continued theft of Land, demolition of homes and utility infrastructures and the continuing denial of freedom and all human “rights” the Palestinian birthright. We demand that President Abbas through the U.N. and The Courts of International Law and Justice act forcefully and decisively against Israel and to restore the Palestinian Peoples.COPY PASTE AND USE IT. An Israeli civil rights NGO is preparing to sue the Palestinian Authority in the International Criminal Court (ICC) for its alleged responsibility for thousands of terrorist attacks on Israel. But why should any daft Israeli ploy get in the way of a very necessary and urgent Palestinian move at the ICC?